Amerisa Suites in Santorini is built in a very convinient location which is viewing the east part of the island, the blue sky and the beautiful Aegean sea while being in the capital of the island, Fira. Amerisa Suites will impress its guests with its design which is minimal and elegantly put. Facilities are state of the art and all guests that wish to experience luxury in accommodation will surely enjoy their stay. The suites at the Amerisa Suites can provide all guest with comfort and convenience. Enjoy the breath taking view from the guest terrace while you enjoy relaxing moments drinking the local wine and fresh fruit offered on guest welcome. 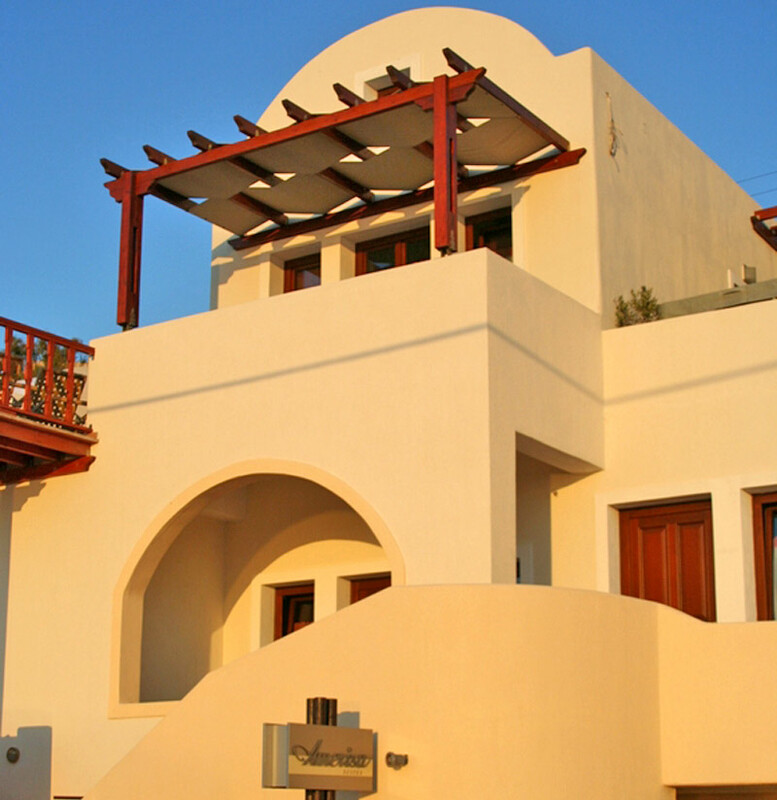 Amerisa Suites Santorini Hotel consists of 10 luxurious rooms and 4 suites. All rooms and suites offer king-size beds, air conditioning, a telephone, safety deposit boxes, DVD-home cinema, satellite plasma television, mini bar, fridge, Jacuzzi shower, bathrobes and slippers and of course a private balcony to enjoy the magnificent view.Park your car at the private parking of the Amerisa Suites, check-in in one of the many wonderful rooms or suites and enjoy your stay! Have a brake at the snack bar or relax in the heated pool or the external Jacuzzi, maybe you could even request a massage after a long day!